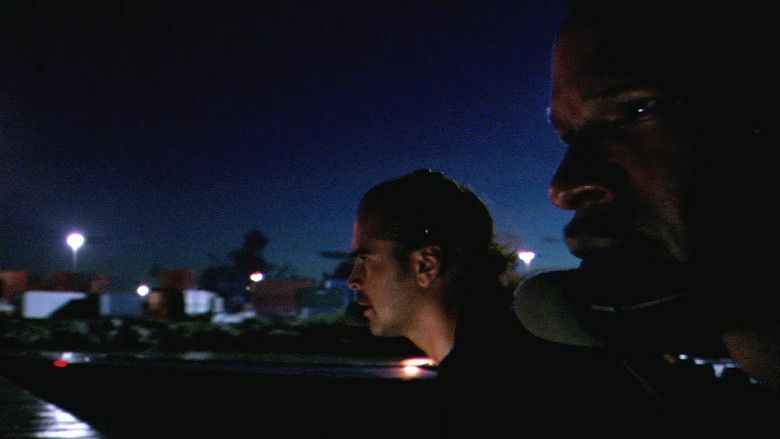 A brooding intersection of deception and vulnerability, Michael Mann's Miami Vice is a potent crime saga that fearlessly pushes the boundaries of the genre. On its face, this film is an anticlimactic affair. There are one and a half shootouts in its two hours plus running time. Sparse dialogue is woven in between lengthy segments of longing stares and contemplative meditations. The story is not fully resolved and ultimately, the entire plot is essentially a McGuffin, allowing viewers to explore complex themes of masculinity and the blurring of identities while masquerading as a typical cop story. The first act deals with exteriors, both in the physical world and within the mind. The action begins with a boat race off the coast of Miami in which a group of undercover narcotics officers begin the excruciatingly slow task of insinuating themselves into the local criminal ecosystem. They must appear as players in a game they can't technically play. They exude a sense of cool uncommon to other police pictures. Most prototypical detectives wear their flaws on their sleeves, but in Mann's sweaty neon underworld, the cops and robbers are one in the same, with each persona housing their flaws and fears within an armor of linen suits and slick vehicles. Excess, or rather the idea of excess is the central vein of the introductory sequence. Highlighted by Jay Z and Linkin Park's top 40 anthem, the jungle is no longer a back alley, graffiti laden affair. It is a tangible playground of dangerous gatekeepers and a living embodiment of ardor that hangs above the dancefloor like a specter, animating your wildest dreams. It's during this initial setup that the many faces each character dons begin to reveal themselves. The central quartet of Crockett, Tubbs, Trudy, and Gina stand sentinel over the writhing masses while Switek and Zito ply their various trades. When violence erupts, it is swift and brutal, communicating to the viewer that while these are officers of the law, they are no angels, willing to risk anything for their fellows. From here, the story transitions into familiar territory. Bad guys are doing bad things and of course, only the elite Miami Vice team can stop them. What's interesting is in how Mann injects his tried and true apex male loner archetype into the proceedings. Colin Farrel's Crockett and Jamie Foxx's Tubbs are two sides to a familiar coin, yet it is their division as separate entities that allows Mann to delve deeper into his own constructs. Tubbs is in love, in an actually healthy relationship, representing a dream that Crockett knows he'll never attain, however, both characters have an unexpected amount of stability, despite having to wear different masks virtually every day. The changing of personalities and the blending of psyches is the undercurrent of the film. As Crockett finds himself drawn to the wife of a dangerous drug dealer (the criminally underrated Gong Li) it is his personal understanding of who he is that allows him to ultimately find a way out and this is a fascinating choice. It would have been easy to allow things to go completely awry. The parallel with the television series is clear, Crockett routinely got involved with the wrong woman, however, where the show often went for pitch black humor, its cinematic counterpoint is interested in pathos, where the karmic price for a lifetime of psychological manipulation comes due. These are women and men whose endless layers threaten to undo them routinely, but Mann isn't interested in (predictably) bleak comeuppance, he instead chooses to explore heartbreak and futility and what could be more humane? The middle portion of the film is perhaps the most interesting, while also being the most grounded. Devoid of action, Mann takes an already slow presentation and grinds everything to a wounded crawl, ensuring the viewer has no choice but to descend into Crockett and Tubbs' various predicaments alongside them. It is a confusing, purposefully labyrinthine endeavor that culminates in the inevitable revelation of the detectives' true identities, but the inexorable advance towards it more important than the reveal. Farrell and Li's chemistry is palpable, creating an sexually charged center to a neo-Shakespearean tragedy. However, while the summation of their affair is telegraphed long in advance, it is the understanding that both characters also know this truth that enhances the melancholic ambiance. Miami Vice is more of a living, breathing world than a traditional film. A pastel mood piece that virtually walks off the screen in every sequence, it is the kind of film you can touch, smell, and feel and this is why its lukewarm reception has been forsaken over the 13 years since its release. It is a seminal effort in Mann's storied filmography, but it is also a transcendental masterwork that shows the immense capabilities of crime stories. Any genre can achieve arthouse sensibilities and Miami Vice does so with wounded panache and thought-provoking swagger. The finale brings together the threads for three climatic scenes before uncoupling everything into the ether of systemic impotence. There is a faux-shootout in a dingy trailer park, starting the denouement within the origins of each of the players. This is a tale that begins on the dirty streets of a cancerous metropolis and Mann's decision to begin the end within a soiled double-wide juxtaposed under the lights of the city proper is brilliant, further highlighting the theme of masks within masks. The next, more traditional action scene (the only one in the film) is filled with confusing dialogue, unusually loud explosions and gunfire, and most importantly, a sense of mortality that is ever present within Mann's oeuvre. These are normal people thrown into extraordinary circumstances that usually resolve themselves with bloodshed and Vice is no exception. The shootout serves not as a capstone, but as a setup for the true showdown: Crockett's confrontation with his true self. As Crockett and Isabella stare into ocean, all of their cards are on the table and the understanding that there is no way back is heartbreaking. Her husband, the true quarry unceremoniously escapes and Crockett is forced to send the love of his life into hiding. 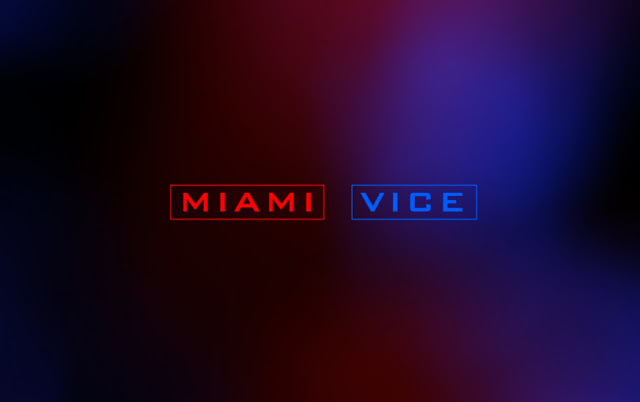 This scene is punctuated by Mogwai's Autorock, a song whose Pyrrhic tones will stay with the viewer longer after the Miami Vice logo that ends the film fades to black. This is why Miami Vice is such an important film. While the deconstructions of expected tropes are absolutely important, it is the human aspect, the admission that there is no safe way out that is essential. Stories about people pretending to someone else have existed since the inception of the medium. Mann's Vice not only understands our fascination with identity and personas, it refuses to compromise itself by playing into expectations, electing to create a vibrant, dangerous world that lives beyond its celluloid confines and exists within the mind's eye, carefully reminding us that even when our best efforts fail, it is the person we become, the one who is changed by the fires of adversity and heartbreak, that truly define us.